With the re-opening of the exhibition Masterworks: Jewels of the Collection, we asked our Curatorial Department to help us explore a painting on display titled, Shiva Vishavarupa. RMA: How was the painting used by the viewer? Such paintings usually serve two main purposes, devotion and initiation. Depicting a rather esoteric subject this painting was probably not accessible to the general public but to initiated only. In the Newar context such objects would be accessible on a second floor of the temple, above the generally accessible part, where the holist images are located. RMA: Is this particular Shiva Vishvarupa markedly similar or different to others in the genre? There is an old tradition of cosmic imagery termed Vishvarupa, the earliest ones being Indian stone sculptures Vishnu. Those images do have multiple heads but their cosmic quality is mostly expressed through other deities inscribed onto their body. With Shiva the cosmic aspect is fist expressed through the linga, with or without faces in the four directions. 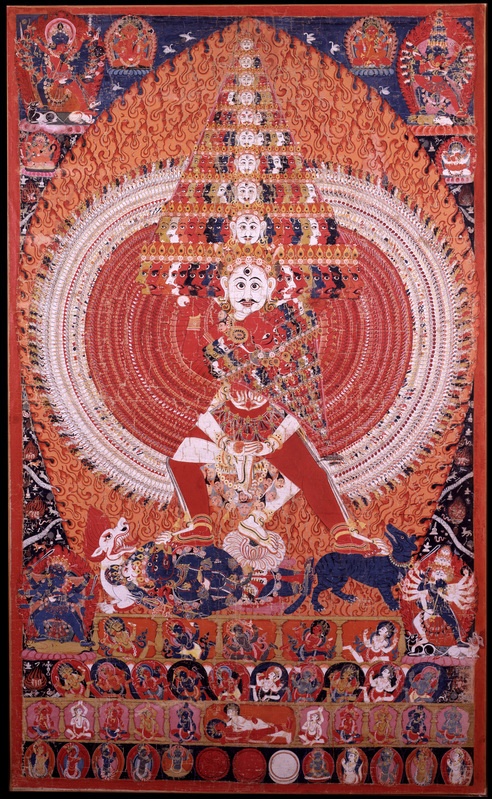 Siva Vishvarupa images like the one in Masterworks are late and specifically Newar in their iconography and composition. RMA: Where about and under what conditions would the viewer see this work at the time it was made? As stated, such paintings usually served two main purposes, devotion and initiation. Essentially the image would not leave the temple, or only if a larger space is needed for initiation.See the answer to the first question for details. RMA: Who was the original audience for this painting? Practitioners of some form of devotional practice to this deity and those to be initiated. To view this and other incredible works like this, visit the exhibition Masterworks: Jewels of the Collection. This entry was posted in Exhibitions, Gallery Tours, Himalayan Art, Staff Connections. Bookmark the permalink.